Credit Restored! | LOFTY CREDIT! EITHER DO IT YOURSELF OR LET US DO IT FOR YOU WITH STELLAR RESULTS ! Late Payments, Repossessions, Charge-Offs, Collections, Student Loans, Foreclosures, Bankruptcies, Inquiries, Child Support, IRS Tax Liens Liens, Judgments, False Info – REMOVED (see our Testimonial Page)! More Powerful Than Other Programs Because We Interact With All Three Major Credit Bureaus On Your Behalf Using Time-Tested Effective Process! Faster Process – Most Say 60+ Days Our Clients See Desired Results Within 45 Days!! More Direct And More Thoroughly Aggressive Using Consumer Federal Laws! No Endless Recurring Payments and an optional flexible installment pay Option! Permanent Solution – Once Negative Items Are Removed They NEVER Reappear! Work With Proven Veteran Consumer Advocate Professionals! Discounted Authorized User & Primary Tradelines To Boost Your Score! No Need To Obtain Police Reports nor to Submit Identity Theft Affidavits! Now, imagine one day soon… you wake up and look at your new credit reports and see all of those negative items gone! That’s exactly what happens when you deploy our Master Clean process. Now continue to imagine… the salesman at your local Mercedes Benz or BMW dealership has a glazed-over look in his eyes after printing out your credit report for review. He sees those nice high scores above 750. That salesman knows at that very moment he’s getting a commission that day. And likewise, of course, you already knew you’d be driving your new Benz or BMW Beamer off the showroom floor. But, here’s the best part, you’ll be getting your new car with no money down and with a very low or no interest rate. HELLO… Now that’s living!! That’s why we recommend our Master Clean process, we become your proxy to effectively battle with the credit bureaus. Hence, his ability to effectively handle all their infamous stalling tactics is phenomenal, making the Master Clean process the fastest most efficient known credit cleaning process available today. 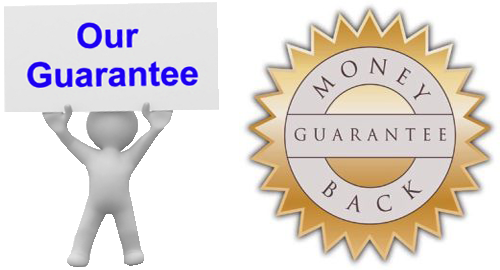 And we’re so sure of our process that we put our money where our mouth is – we provide a Money Back Guarantee (see below for full details). After we’ve deployed our Master Clean process on your credit profile you could expect to apply for lines of credit at various banks seeking $50,000 – $250,000 and only require a signature and nothing more. Naturally, purchasing real estate also just got a lot easier too. If you were having difficulty acquiring a mortgage or funding of any kind on account of your poor credit then you’re about to have a very pleasant paradigm shift. After our Master Clean process has done its work, mortgage brokers and real estate agents will be seeking you instead of avoidance tactics and offering excuses. Whether you are an investor, new home buyer, or a consumer of any kind having near perfect credit should be your goal. We immediately and directly engage all three major credit bureaus on your behalf in such a way as to virtually guarantee the win you seek and deserve. Most consumers are unaware of the game that is played by these private entities known as consumer credit bureaus and further believe these agencies have some government affiliation with inherit federal power. Wrong. These private entities are essentially powerless to maintain negative information about we the people. It’s all an illusion in the matrix and we’ll happily prove it to you! ! IF YOUR CREDIT SCORE ISN’T AT LEAST 750 YOU NEED THIS! If after 12 months we are unable to perform by removing the majority of negative items from your credit profile (majority is: 80%), then 80% of client’s initial fee paid to LC will be refunded back to them. However, this refund is contingent upon the following: (1) While during the entire time of implementing LC’s process, client must have duly preformed and followed our specific instructions in a timely fashion. Moreover, the instructions inform the client that they must PROMPTLY convey to us all communications from the credit bureaus with respect to their credit profiles once received. This also includes client responding timely for any and all other requests that are required for the implementing of LC’s process. But it is vital that all written (or verbal communications) from Equifax, TransUnion and/or, Experian be conveyed or given to us at the time of client receives them. (2) If the client utilized our installment pay plan, all necessary installment payments must’ve been paid promptly on time, on or before the due date. Also, we offer no guarantee that client’s credit score will increase upon the completion of LC’s service (this is because, after removing all negative items from client’s credit profile there could be insufficient “good” credit remaining (i.e., creditor reported payment history aka “tradelines”) to help bolster and improve client’s credit score. *At No Additional Charge; Within a two year period, we well continue to remove any subsequent new derogatory items from a returning client’s credit profile if they experience legitimate financial hardships causing late payments to be reported to their credit profiles from any of the three major credit bureaus. This extended service does not apply to and is not extended to individuals who are deemed as chronic spenders with no regard to having fiscal responsibility nor self discipline. Although most client credit situations will fit into our formula of repair, you must first contact us providing login credentials for your credit monitoring service in order to allow us to preform an evaluation of your current credit profile before the price can be set appropriately.